This study aims to offer a new explanation for the momentum effect in international government bonds. Using cross-sectional and time-series tests, we examine a sample of bonds from 22 countries for the years 1980 through 2018. We document significant momentum profits that are not attributable to bond-specific risk factors, such as volatility or credit risk. The global bond momentum is driven by the returns on underlying foreign exchange rates. Controlling for currency movements fully explains the abnormal returns on momentum strategies in international government bonds. The results are robust to many considerations including alternative sorting periods, portfolio construction methods, as well as subperiod and subsample analysis. "The various types of momentum effects have also been documented in government bonds, implying that the fixed-income winners outperform fixed-income losers. Although the finance literature extensively discusses the sources of momentum in an equity universe, the specific explanations for momentum in government bonds are rather scarce. This paper aims to contribute in two ways. First, we provide new evidence on the momentum effect in international government bond markets. Using cross-sectional and time-series tests, we investigate a sample of government bonds from 22 countries for the years 1980 through 2018. Second, and more importantly, we offer and test two new explanations of momentum. 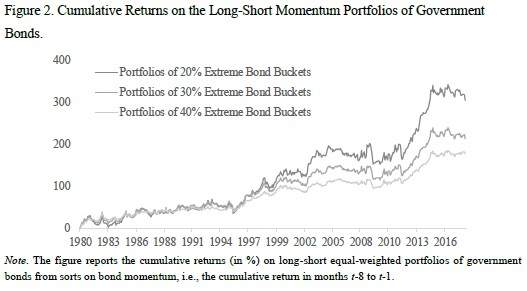 Our first hypothesis builds on Conrad and Kaul (1998): we conjecture that the momentum in bonds may simply capture the cross-sectional variation in long-run returns. In other words, the top performing assets continue to deliver higher returns because they exhibit excessive risk exposure. In particular, we assume that the winner (loser) bonds may display high (low) exposure to duration and credit risks, which drive the excessive long-run returns. The second hypothesis is that the momentum in bonds might be driven by the returns on underlying currencies. The primary findings of this study can be summarized as follows. We document a strong and robust momentum effect in government bonds. An equal-weighted portfolio of past winners tends to outperform past losers by 0.24–0.35% per month. The effect is not fully attributable to the risk factors in government bonds, which explain 38–55% of the abnormal profits. Nevertheless, the phenomenon is entirely explained by the momentum in underlying foreign exchange rates, which is consistent with our second hypothesis. Once we control for the currency returns in cross-section or time-series tests, the momentum alphas disappear. The results are robust to many considerations, including alternative sorting periods and portfolio implementation methods, as well as subperiod and subsample analyses." In this short paper, I follow the p-hacking explanation to its logical conclusion. To rigorously pursue the p-hacking theory, I write down a statistical model in which factors have no explanatory power, but published t-stats are large because the probability of publishing a t-stat ti follows an increasing function p(ti). 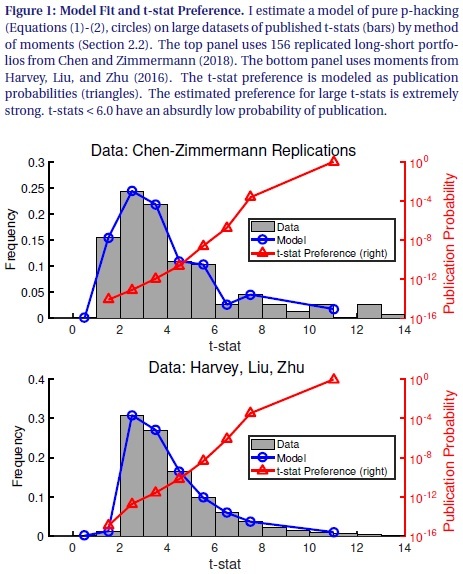 I estimate p(ti ) by fitting the model to the distribution of published t-stats inHarvey, Liu, and Zhu (2016) and Chen and Zimmermann (2018). The p-hacking story is powerful: The model fits either dataset very well. Though p-hacking fits the data, following its logic further leads to absurd conclusions. In particular, the pure p-hacking model predicts that the ratio of unpublished factors to published factors is ridiculously large, at about 100 trillion to 1. To put this number in perspective, suppose that 10,000 economists mine the data for 8 hours per day, 365 days per year. And suppose that each economist finds 1 predictor every minute. Even with this intense p-hacking, it would take 15 million years to find the 316 factors in theHarvey, Liu, and Zhu (2016) dataset. This thought experiment demonstrates that assigning the entire factor zoo to p-hacking is wrong. Though the p-hacking story appears logical, following its logic rigorously leads to implausible conclusions, disproving the theory by contradiction. Thus, my thought experiment supports the idea that publication bias in the cross-section of stock returns is relatively minor." - momentum is not an anomaly in a risk-based asset pricing framework. Riskier assets tend to be in the loser portfolios after (large) increases in the price of risk. The risk of momentum portfolios usually decreases with the prevailing price of risk, and their risk premiums are approximately negative quadratic functions of the price of risk (and the market premium) theoretically truncated at zero. This paper offers theoretical, empirical, and simulated evidence that momentum regularities in asset prices are not anomalies. Within a general, frictionless, rational expectations, risk-based asset pricing framework, riskier assets tend to be in the loser portfolios after (large) increases in the price of risk. Hence, the risk of momentum portfolios usually decreases with the prevailing price of risk, and their risk premiums are approximately negative quadratic functions of the price of risk (and the market premium) theoretically truncated at zero. The best linear (CAPM) function describing this relation unconditionally has exactly the negative slope and positive intercept documented empirically. We document that the variation in market liquidity is an important determinant of momentum crashes that is independent of other known explanations surfaced on this topic. This relationship is driven by the asymmetric large return sensitivity of short-leg of momentum portfolio to changes in market liquidity that flares the tail risk of momentum strategy in panic states. This identification explains the forecasting ability of known predictors of tail risk of momentum strategy such that the contemporaneous increase in market liquidity predominantly sums up the trademark negative relationship between predictors and future momentum returns. Our results are robust using a different momentum portfolio and alternative measures of market liquidity that make a substantial part of the common source of variation in aggregate liquidity. This paper employs the ZCAPM asset pricing model of Liu, Kolari, and Huang (2018) to show that momentum returns are highly related to market risk arising from return dispersion (RD). Cross-sectional tests show that momentum risk loadings and RD risk loadings are similarly priced in momentum portfolios. Comparative analyses find that zero-investment momentum portfolios and zero-investment return dispersion portfolios earn high returns relative to other risk factors. Further regression tests indicate that zero-investment momentum returns are very significantly related to zero-investment return dispersion returns. We conclude that the momentum mystery is explained by market risk associated with return dispersion for the most part. This paper proposes a set of novel pricing factors for currency returns that are motivated by microstructure models. In so doing, we bring two strands of the exchange rate literature, namely market-microstructure and risk-based models, closer together. Our novel factors use order flow data to provide direct measures of buying and selling pressure related to carry trading and momentum strategies. We find that they appear to be good proxies for currency crash risk. Additionally, we show that the association between our order-flow factors and currency returns differs according to the customer segment of the foreign exchange market. In particular, it appears that financial customers are risk takers in the market, while non-financial customers serve as liquidity providers. Title: The Profitability of Carry Trades: Reality or Illusion? We carry out a large-scale investigation of the profitability of carry trades, using foreign exchange data for 48 countries spanning a period from 1983 to 2016 and employing a stepwise test to counter data-snooping bias. We find that, while we can confirm previous findings that the carry trade is profitable over this long period when a specific carry-trade strategy is selected based on the whole data set, even after controlling for data snooping, when we split the sample into sub-periods, the best carry-trade strategy in one sub-period is generally not profitable in the next sub-period. This finding holds true even when we include learning strategies and stop-loss strategies. Our findings thus highlight the instability of carry trades over long periods and their limitation in the sense that it is hard to predict their performance based on several years of data and therefore to choose a profitable carry-trade strategy ex ante. This study employs a conditional factor model in order to investigate the time-varying profitability of currency carry trades. To that end, I estimate conditional alphas and betas on the popular dollar and carry factors through the use of a nonparametric approach. The empirical results illustrate that the alphas and betas vary over time. Furthermore, I find that the alpha of a high interest rate currency portfolio increases in a trough in a business cycle and in a state of high market uncertainty. However, the beta on the dollar factor decreases in these market conditions, suggesting that investors reduce the foreign currency risk exposure. 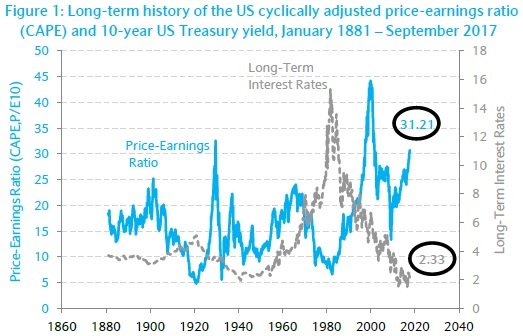 "Campbell & Shiller's Cyclically-Adjusted Price to Earnings ratio (CAPE), is a well known to characterize the strong relationship between an inflation adjusted earnings-to-price ratio and subsequent longterm returns. As a result, it has now become an often cited measure of equity market valuation. 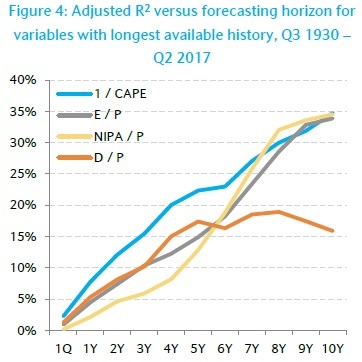 With such a status, the current value of CAPE, 31.12 (as in 10/2017), is causing concern amongst investors and spurring debate among academics - it is currently in 96th percentile compared to its own history since 1881. Thus, the question of whether the US stock market is overpriced, is being hotly contested and CAPE is at the centre of this debate. 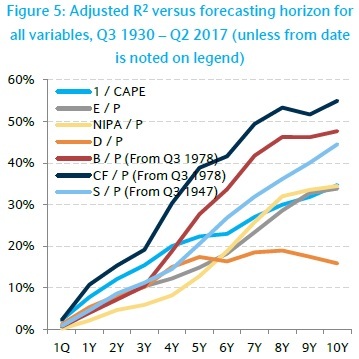 Critics mainly focus on ways to claim that the observed CAPE ratios are too high and not valid for reasons such as statistical significance and/or changing accounting standard over the years. Siegel (2016) proposed an alternative of National Income and Product Account (NIPA) corporate profits from the Bureau of Economic Analysis to be used in context of correcting the bias in CAPE. We therefore look closely at these claims but also compliment this alternative CAPE constrution using NIPA profits, with version using operating earnings, cash flow, sales and book value as other earnings related proxies. Figures 4 to 6 report R^2 and averaged t-statistics for our predictability regressions. They should be reviews in tandem. 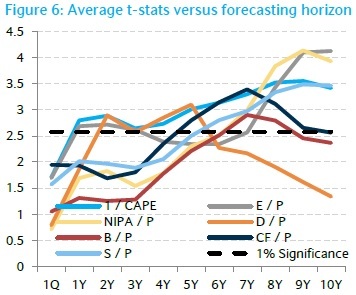 Figure 4 demonstrates the ability of CAPE in forecasting returns better then E/P, NIPA/P and D/P at shorter horizons. E/P and NIPA/P eventually catch up and significantly so, as confirmed by their t-statistics in Figure 6. 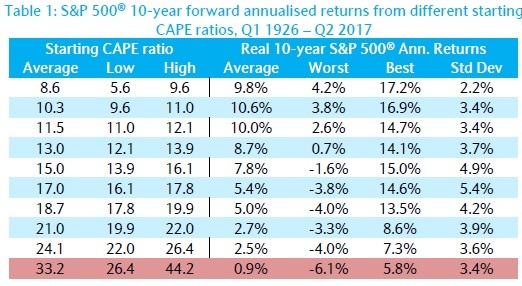 However it is clear, that CAPE is able to consistently predict subsequent returns significantly so from a 1Y horizon onwards. Figure 6 perfectly highlights the small sample bias in long horizon regressions when comparing the R^2s of B/P, CF/P and S/P with those in figure 5. Whilst the R^2s may appear higher, especially at the longest horizons, Figure 6 shows that past a 5Y horizon, S/P is the only variable that is consistently significant.